Roofing underlayment has been a part of the installation process since the Gold Rush of the early 1800’s in California. Tar or felt paper has been the staple until the evolution of synthetic underlayment came along in the early 2000’s. 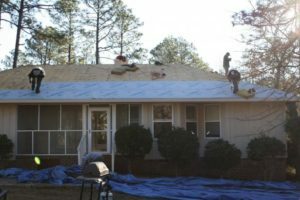 There are many roofing contractors that still swear by 15 lbs felt and others, like us, that exclusively use a synthetic underlayment in one form or another. Many prefer the cost of felt over synthetic underlayment but when you look at the linear feet per role it actually is not that much more. At Consolidated Roofing Systems we primarily us InterWrap’s Titanium UDL 30. It comes in a 10 square (1000 sq. ft.) roll versus a 2 square (200 sq. ft.) roll that 15 lbs and 30 lbs felt come in. Not to mention the rolls are much lighter. For years we used a fiber glass backed felt but found that it too over time had it’s limitations. Felt paper is paper that is dipped in asphalt. When it gets wet to any degree it will wrinkle where synthetic underlayments do not. However, both products must be applied straight and tight to avoid man made wrinkles and tears. Button cap nails are the preferred fastener to both which creates a water tight seal when applied properly. Properly installed Titanium UDL 30 provides a guaranteed waterproof structure for up to 6 months without shingles! There is no felt paper made that can provide that kind of protection. Granted, in residential re-roofing houses are rarely exposed for that long. However, it does provide a good peace of mind knowing that the product under the shingles provides that kind of protection. Doing your own research will bring you to many different conclusions as will asking various roofing contractors opinions. As always, the best coarse of action is to speak to a reputable and local roofing contractor to find out what is the best option for your home.